Following up on my previous post, I have now read through parts of the World Internet Institute’s new report about how Swedes use the internet. – 350,000 Swedes have a blog (estimate), or 6% of the online population. 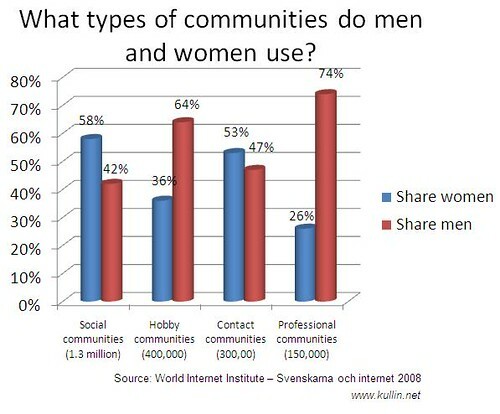 – 1,900,000 Swedes read blogs (estimate), or 33% of the online population. That means that there are more than five times as many blog readers as there are bloggers. Possibly a good argument against the common view that “nobody reads blogs”. 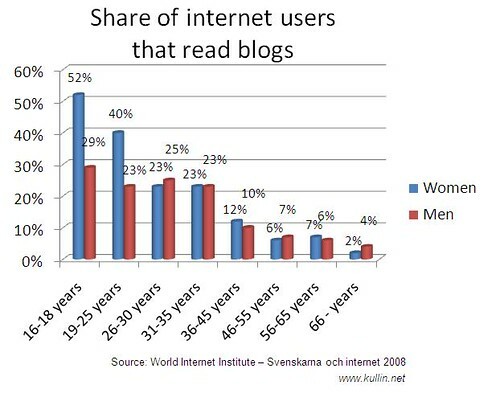 – Young women between 16 and 25 years are frequent blog readers, see graph below. As many as 52% of all girls 16-18 years that are online, read blogs.